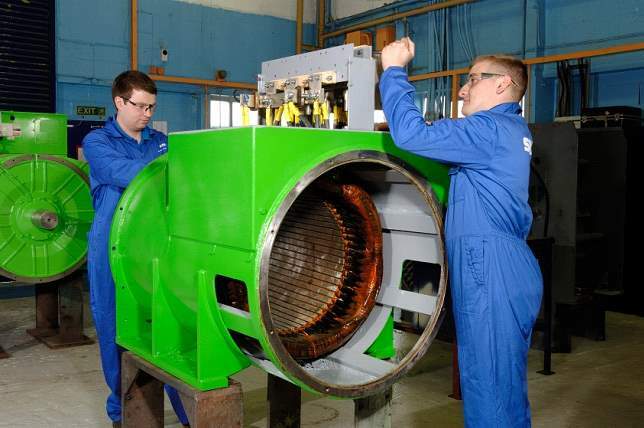 Sulzer operates one of the most comprehensive maintenance, repair and technical support services for large capacity motors and generators worldwide, providing everything from testing to complete re-builds. Owners and operators of three-phase asynchronous motors manufactured by Franz Wölfer Elektromaschinenfabrik can now call Sulzer from anywhere in the world to assist with the repair and maintenance of their motors, safe in the knowledge that the service is fully supported by the manufacturer. Working in harsh outdoor operating conditions both inland and out at sea, Wölfer motors are manufactured to meet demanding quality and performance standards. Many are designed specifically to fit custom applications where the motor forms part of a larger machine or structure. Used widely in hoists and marine power applications, motor performance specifications are extremely precise while windings can also be highly specialized; all of which requires specialist expertise to service. Franz Wölfer Elektromaschinenfabrik has been developing and manufacturing electric motors for use in hoisting equipment, on ships and in general mechanical engineering for over 60 years. 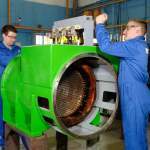 As a specialist in manufacturing large bespoke motors the company has a huge installed base around the globe. Looking after this legacy equipment is extremely important to both the company and its customers. When quality motors reach the outer limits of their design life, while still reliable, they can benefit from timely maintenance and overhaul in order to extend operating life. Unforeseen circumstances can also cause damage and premature failure, especially in unpredictable environments such as being out at sea; these emergency repair situations are the real test of a service supplier. Sulzer is able to respond extremely quickly to both routine and emergency repair situations and because the organization is focused on response time, as well as guaranteeing quality, it makes an ideal service partner for an OEM manufacturer such as Franz Wölfer.